This species is accepted, and its native range is Peru to Brazil and N. Argentina. Nativa en Colombia; Alt. 0 - 1675 m.; Amazonia, Andes, Guayana y Serranía de La Macarena, Islas Caribeñas, Llanura del Caribe, Orinoquia, Pacífico, Valle del Cauca, Valle del Magdalena. A common weed of waste places near dwellings, throughout the area. Erect annual or a few times short-lived perennial herb up to 150 cm. high. Stem quadrangular, thick, empty or pithed, woody to the base, variably hairy. Leaves alternate or subopposite; petiole 20–70(110) mm. long, pubescent, with scattered bristles; lamina 40–170 x 30–130 mm., ovate to broadly ovate or triangular-ovate, strigose by areolae and with scattered bristles, roughish or only punctate above, generally pubescent-villous, rarely tomentose or punctate and with some scattered bristles mainly on the nerves and veins below, acute at the apex, obtuse to subcordate at the base and abruptly decurrent on the petiole, often with crisped margins; secondary nerves 4–8 on each side of the midrib. Cymes long and flexuous, up to 36 cm. long when completely expanded, usually shorter, ± dense, single or sometimes in pairs, on a short terminal peduncle. Calyx lobes 1.5–3.5 mm. long, narrowly elliptic to subulate, unequal, sparsely hispid. Corolla 3.5–5.0 mm. long, hypocrateriform, pubescent outside, glabrous inside, white or rarely mauve or blue; tube 3.0–4.5 mm. long, usually longer than the calyx; lobes c. 0.6 x 1.0 mm., depressed-ovate, rounded at apex. Stamens inserted at 0.8–1.0 mm. from the base of the corolla tube; anthers 0.5–0.9 mm. long, narrowly ovate, cordate at the base, subsessile. Ovary with 4 fleshy crests, glabrous. Style 0.5 mm. long, terete, glabrous; sterile appendix hemispheric. Fruit deeply bilobed, mitre-shaped with the lobes strongly divergent, glabrous or puberulous, first divided into 2, each one c. 4 x 4 x 2.5 mm., later split into 4 nutlets, these angular, rostrate, with the surface 3-ribbed; each nutlet with 2 cavities, the distal one fertile and the proximal one empty and larger than the other. Robust erect tufted perennial or annual herb or subshrubby herb 0.2–1.5 m. tall, usually much branched; stems woody at the base; young stems juicy, with short pubescence and coarse bristly longer white hairs, eventually glabrous or obscurely tuberculate. Leaves alternate or opposite, blades ovate to elliptic or ± triangular, (1.5–)3– 16 cm. long, (0.5–)1.3–10 cm. wide, acute or acuminate at the apex, mostly abruptly truncate then very narrowly attenuate into the 1–7 cm. long petiole, or even ± subcordate or obtuse, the margin irregularly undulate, slightly bullate with nervation distinct beneath, with dense short tubercle-based hairs and sparser longer white hairs, sometimes almost velvety beneath. Flowers numerous in long dense single scorpioid cymes, unilateral, 2.5–45 cm. long, rolled up at the summit, with short pubescence and long setiform white hairs; peduncle up to 5 cm. long; pedicels obsolete. Calyx divided ± to the base into lanceolate leafy lobes 2.5–3 mm. long, sparsely white bristly hairy and with shorter pubescence. Corolla blue, lilac or often white; tube cylindrical, 3–4.5 mm. long, widened at the base, funnel-shaped above, sparsely pubescent outside; limb 3–4 mm. wide, lobed for ± 1 mm., the lobes rounded, 0.5–1 mm. long, 1–1.5 mm. wide. Ovary globose with 4 erect fleshy crests; style 0.5–0.7 mm. long, the stigma discoid surmounted by a hemispherical dome. Fruits brown, ovoid, glabrous or glabrescent, grooved, splitting first into 2 cohering pairs of nutlets then into 4 trigonous-ovoid nutlets 4 mm. long, 2 mm. wide, produced, almost wing-like, and acuminate at the apex, the outer face with 3 sharp ridges ± anastomosing at the apex; internal faces devoid of cavities, smooth and convex. Bushland, plantations, old cultivations, roadsides, mostly in damp sandy places, e.g. 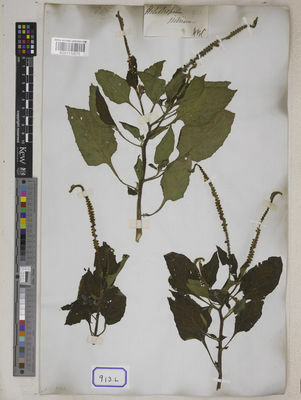 river banks, also on riverine mud; 0–975(–1600) m.
Heliotropium africanum Schumach. & Thonn. di Fulvio, T.E. & Espinar, L.A. (2016). 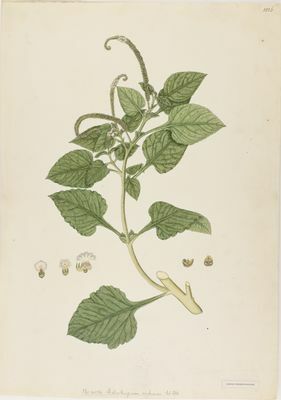 Las especies Argentinas de Heliotropium (Boraginaceae) Boletín de la Sociedad Argentina de Botánica 51: 745-787. Martins in Flora Zambesiaca 7(4): 91, t. 26/8 (1990). Vollesen in Opera Bot. 59: 76 (1980). Taton, Flore du Congo Belge, du Ruanda et du Burundi, Borag. : 28, map 8 (1971). Heine in Flora of West Tropical Africa, ed. 2, 2: 321 (1963). F. W. Andr., The Flowering Plants of the Sudan 3: 85 (1956). I.M. Johnston in Journ. Arn. Arb. 32: 111 (1951). Bak. & Wright in Flora of Tropical Africa 4(2): 32 (1905). Hiern, Cat. Afr. Pl. Welw. 1: 719 (1898). C.B.Cl. in Fl. Brit. Ind. 4: 152 (1883). Vatke in Linnaea 43: 318 (1882). Sims in Bot. Mag. 43, t. 1837 (1816) (early refs.). L., Sp. Pl. : 130 (1753).